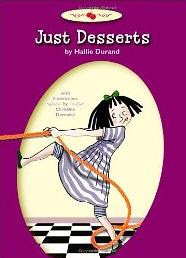 My Thoughts: Fans of Ramona and Beezus will love "Just Desserts". I laughed out loud with this book, it made me reflect on my childhood, I have one older brother, I was his annoying sibling and he was mine. This is a sweet, funny and entertaining story with a great lesson, siblings can be annoying but like the saying goes "You can't live with them and you can't live without them". The Illustrations were a great touch, although they were simple they added a lot of character to the book. I can see families trying dessert first after reading this story to their kids and the recipes in this book were a tasty bonus. I can't wait to read what's next for Dessert and what other shenanigans she stumbles into. This is great book that all kids should read and the ones with "annoying siblings" will see that they are not alone. A great read with a great valuable lesson. This looks like something my nieces & nephews might like! Thanks for the review - cute blog too. Thanks for particpating in the challenge!